1. Unfortunately it is not possible to use Uplay in any way with Linux. So logging in first time is as impossible as any other time. 2. Windows is no option. Besides other reasons i have already spent too much money for H6 (bought 2 different versions). I won't spend any single more dime for yet another software. So for me the consequences will be: Ditch h6. Until now i hoped that some day there will be a solution. Even if that solution would not be perfect, i would accept it. But not beeing able to play at all is not acceptable. I have a problem that seems to be commonly experienced, but I can't for the life of me find the solution anywhere online. In certain maps, at certain times, my screen will go to this darkened version where only glowing things are visible. The game is still playable (but for the fact that you can't see anything) and the music is on still, but everything's dark. It's almost like the game went into night vision mode, because that's kind of how it looks. This isn't the "dark screen before a battle" problem. It happens randomly and only on certain maps. I can quit out of it, but when I go back in, other maps are also darkened. Not 100% sure that it's a solution, but have you tried updating your graphics' drivers? I have similar problem with H6. It appeared with latest patch, and just stayed. I contacted Ubi, and they just told me to update drivers. I did that, and it still was dark. In the end I just gave up, and removed H6 from my computer. I have restarted playing Heroes 6, assuming the bugs would have been fixed already. It seems the truth is far from that. But the Necromancy II bug. Has anyone found any solution to that? Necromancy II just doesn't work, it's always greyed out. I'm glad there is a topic about bugs involving patch 2.1. Currently I have MMH6 Gold Edition installed on my pc, patched to 2.1.1. But since 2.1 is also quite recent, and there is not yet a topic about 2.1.1 (for as far as I know), I guess it's a good idea to put my bug reports here. The first bug I encountered involves the Dynasty Title selection tab in my in-game profile. I have gathered quite a lot of titles through achievements and the Altar of Wishes, but I can only select a very limited few. The tab opens upward instead of downward, and there is no scrolling option. So basically I am left with the tip of the iceberg, I would really like to be able to select every title, not just a few (whether or not this bug is specific to 2.1.1 I don't know for sure). Before I unlocked the SoD expansion, I could already see the SoD-achievements in the achievement list, but they were greyed out because I had not yet access to this content. However, the game did keep track of my progress regarding these achievements, so I kind of unofficially got the Slayer of Dark Elves-achievement, but not the bonus Tokens and Title. Upon unlocking SoD, the bonus was not added to my existing dynasty seals. That means I have missed several seals I could have used for new items in the Altar of Wishes. A third bug involves the awarding of an achievement I probably should have never received. The 'Sweeping Up'-achievement is gained when you win a game in 2 weeks. I assume that is 2 in-game weeks, but I finished the first map I played after unlocking SoD in over six months. I still got the achievement, though. I was wondering if more people ran into these issues. Edited by Executor64 at 16:40, 07 Dec 2014.
so to be clear, there is no way to enter the game as of late? will there ever be a way again? Edited by Sligneris at 18:07, 20 Mar 2015. 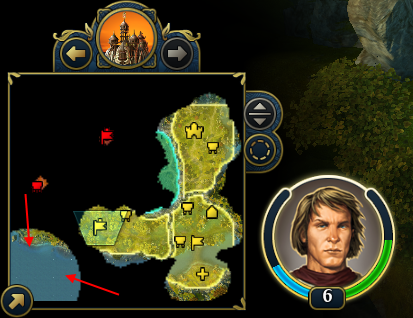 In nearly every game I play, whenever I load one of the games, something like this appears in most cases - bottom left corner of the map is suddenly revealed for no reason. Currently I have MMH6 Gold Edition installed on my pc, patched to 2.1.1. I also have Shades of Darkness, retail version, and redeemed the code in-game. I can't access one of the four scenarios, for some strange reason. "A Princess of VARN", "A Tale of two Guardians" and "The Succession Wars" are unlocked, but Heart of Nightmares is not. How do I unlock this? If I follow the 'purchase' link to the website, I have to buy Danse Macabre....but I already have it, because it is part of the Gold Edition. Technical support has been pretty much useless in that regard. I tried reinstalling the game, too. Update on the Heroes VI gaming front. That is a very well known fact for the past 4 years now. Funny thing though, people still find the way to enjoy the Complete Edition of this game even on today's date. Strange...How come nobody has complained about any bugs ever since the Complete Edition has been released in 2013(6 years ago).